Next week, Cairo Opera and the French cultural center will host French pianist Henri Barda. Barda. His first ever performance in the new Opera House consists of two concerts, both of them in its big hall. On April 7 he will be accompanied by the Cairo Symphony Orchestra under the direction of Ahmed al-Saedi and on the 9th he will perform solo. While Maurice Ravel features both nights, during the second performance the audience will also be treated to Frederic Chopin. If concert-goers are already familiar with Ravel and Chopin, and have already listened to Barda's recordings or read his entries in music encyclopedias, there is a side to him they will not find listed on any of his CD-disc covers. Neither will they find it for that matter in reference books. His early childhood. To discover more about Barda people will either need to read the rest of this article or perhaps browse through the book "Maadi 1904-62: History & Society in a Cairo Suburb." What music dictionaries will not tell you is that Barda was born and raised in Cairo. Up to age 16 he lived between his parent's flat on Soliman Pasha Street and his grandfather's villa in Maadi. Although a regular at Lycee Francais Bab al-Louk, he was enrolled from his very early years at Conservatoire Tiegerman at No.5 Champollion Street. The famous Cairo conservatoire was named after its diminutive founder and director, the Polish-born emigre "Monsieur" Ignace Tiegerman (1893-1968). At first, Barda practiced under Tiegerman's assistant, Madame Sela Menaszes. It was during one of the weeding out sessions that Monsieur realized he had a six year old prodigy on hand. To his surprise, young Barda completed the theme tune of Swan Lake by memory. He had just seen a movie adaptation of Tchaikovsky's ballet, with Margaret O'Brien as an aspiring ballerina, at Cinema Metro. With time, Barda became Monsieur Tiegerman's unchallenged prize student. Runners up included Egypt's Prince Hassan Aziz Hassan and Jerusalemite Edward Wadie Saiid. While the prince never pursued a musical career, Saiid opted for a professoship of literature at Columbia University authoring several books on the Arab-Israeli conflict, Orientalism being one of them. 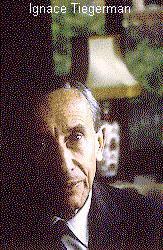 In one of his books, Musical Elaborations (Columbia University Press, NY), Saiid evokes Ignace Tiegerman recognizing his former teacher for the great man he was. Tiegerman introduced Chopin and Schumann to Barda. For the next few years, the apprehensive and at times highly strung Monsieur personally guided, directed and encouraged his gifted student. At 12, Barda made his first publich appearance at one of Betzy (Oscar) Stross' annual salon musical in her apartment at No.17 Kasr al-Nil Street. Her get togetethes were said to have been Cairo's version of Proust's Madame Verdurin. Badra's performance proved a resounding success. Unknowing to the young pianist, others besides the salon musical eagerly awaited his solo performances. The villas of Aziz Zaki Bey, (my father) jurist Dr. Wahid Raafat and businessman Michel Zaidan bordered on the Barda's Maadi homestead. Their respective family members delighted in listening to Barda's nocturnal practice sessions. Maadi was then a suburb who's green vegetation by far outnumbered its population so that its steamy summer nights were tranquil save for crickets, frogs and barking dogs, one of which was Nigra, Barda's black spaniel. Barda was only fourteen when Cairo's leading music critic Albert Bajocchi declared in his weekly column that Tiegerman's prize student had the ear, the memory and the technique. He would go places. This was 1956 a critical year for Barda and his family. And to places Barda went. At 15, Barda resumed his studies with Lazare-Levy and the Conservatoire Nationale Superieur in Paris studying under Joseph Benvenuti and Jean Hubeau. It is at France's most important conservatoire that he won first prize in piano and chamber music. Then off to New York's Juilliard School on a four-year scholarship. Svyatoslav Richter and Vladimir Horowitz whose concerts he attended in Carnegie Hall, were Barda's favorite performers. Was it not Horowitz who allegedly told a friend that the only pianist he feared as a potential rival was Ignace Tiegerman. Both had been colleagues in Berlin. Barda's studies over, it was time for the acid test -- the grueling make-or-break concert circuit which meant performing every other week in some European capital as well as the US, Brazil and Japan. The critics were uncharacteristically merciful. 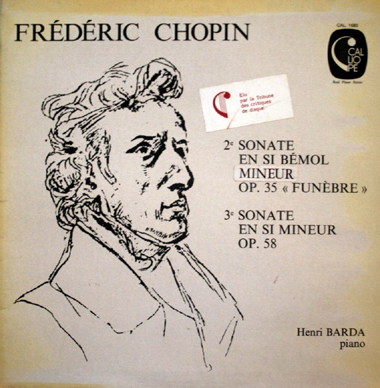 In fact, Barda was described by a leading French monthly Le Monde de la Musique, not known for its clemency, as "simply the best Chopin interpreter of his generation." Le Monde's senior music critic, Alain Lompech, described him admiringly as "le cas Barda", for while greatly admired by his colleagues, he was hardly ever seen in the summer festivals. 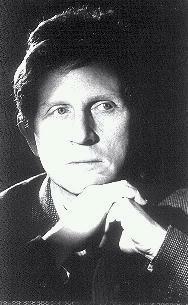 Ignace Tiegerman died from prostate cancer at the Greek hospital in Abbassia in 1968. His faithful students and admirers were with him to the last. But in view of circumstances, the most adept among them was absent. But they had fortunately met in Europe a few years earlier at Tiegerman's cottage in Kitzbuhel, Austria where Barda and Monsieur had great fun performing for one another. Yet Tiegerman died without ever hearing his prize student in concert. Thanks to Barda the Tiegerman technique and soul are alive and well in Paris. So well in fact, that in 1990, Barda, won the Grand Prix du Disque Frederic Chopin in Warsaw for the recordings of the three Chopin's sonatas. In a gratifying sense Tiegerman had made it full circle to his native land. In 1995, Barda's recordings of Ravel's trio and Chopin's three sonatas were listed in France in the "Les indispensables du disque". More recently, he was chosen by West Side Story's choreographer Jerome Robbins, to create the French version of his four ballets on Chopin: 'Dances at the Gatherings', 'In the Night', 'The Concert' and 'Other Dances' all of them with the participation of the Paris Opera Etoiles. After months at the Paris Opera, the show toured in the US, Europe, Russia, Japan and Brazil. Music aficionados mark your calendars. The rendezvous next week is at the Cairo Opera. Barda is coming home and he's bringing Chopin with him!